It works with Amazon Cloud. 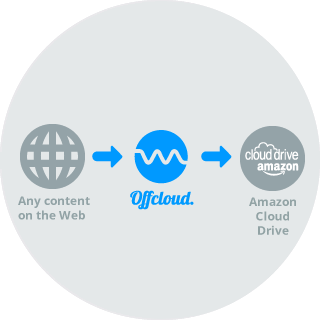 Offcloud lets you send data from the web to your Amazon Cloud Drive. Thanks to remote uploading, Offcloud allows you to take any content found on the web and have it directly transferred to your Amazon Cloud Drive account. All it takes is just a few clicks. Connect your Amazon Cloud Drive account with Offcloud, then submit any links pointing to online content and Offcloud will transfer the data directly to your Amazon Cloud Drive account. Amazon Cloud Drive is the personal cloud storage service from Amazon, Inc. It allows you to securely store your files in the cloud and access them from any device. Offcloud is the perfect complement to Amazon Cloud Drive as it provides it with a remote upload capacity. Thanks to Offcloud, you can download, backup or export any data from the web directly to your Amazon Cloud Drive. Join us now. It's free! All you need to do is enter your email address. You can use Offcloud to upload content to your Amazon Cloud Drive for FREE. With a free account, you can submit up to 3 links. Then, you can use the service without any restrictions for just $9.99.